Anthony Crolla says there will be "no doubt" about the result in his rematch against WBA world lightweight champion Darleys Perez on 21 November. 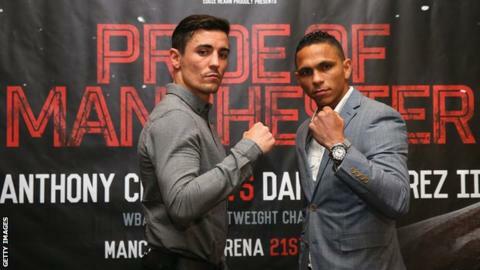 Crolla, 28, was granted a rematch by the WBA after Perez controversially retained his title with a draw in July. "The dream is still alive. In fact, the decision last time has just added fuel to the fire," said the Briton. "I'm expecting a better Darleys Perez and there's certainly going to be a better Anthony Crolla this time." One of the judges had scored the first bout between the pair 116-111 in Crolla's favour, but the other two scored the fight 114-113 for Perez and 113-113, meaning that the Colombian retained his title with a majority draw. Mancunian Crolla suffered a fractured skull last year while attempting to stop two men from breaking into his neighbour's home. "It's changed on the street from being known as the boxer who got hit on the head with a concrete slab to the boxer who got robbed in a world title fight," added Crolla. "I prefer that. But I've moved on and I'll leave no doubt this time around."